The Sandpoint cafe, bistro and wine bar is now celebrating its 10th year in business. It seemed like a good fit at the time. Manuela and Tim Frazier, who met in Europe, wanted to open a European-style café in a unique and storied Sandpoint structure fashioned after a similar bridge in Italy. In 2007, the Cedar Street Bridge Public Market, as it's now called, had just been remodeled after Coldwater Creek vacated its longstanding digs, and the building's new owners envisioned a unique retail and restaurant venue. But then the economy tanked, leaving the Fraziers wondering: What next? "It's a lot of work," says Manuela, who lets out a little laugh and shrugs. Seated towards the back of the Cedar Street Bistro & Coffee Shop she and husband Tim opened in 2008, Manuela has a perfect view to the past 10 years. 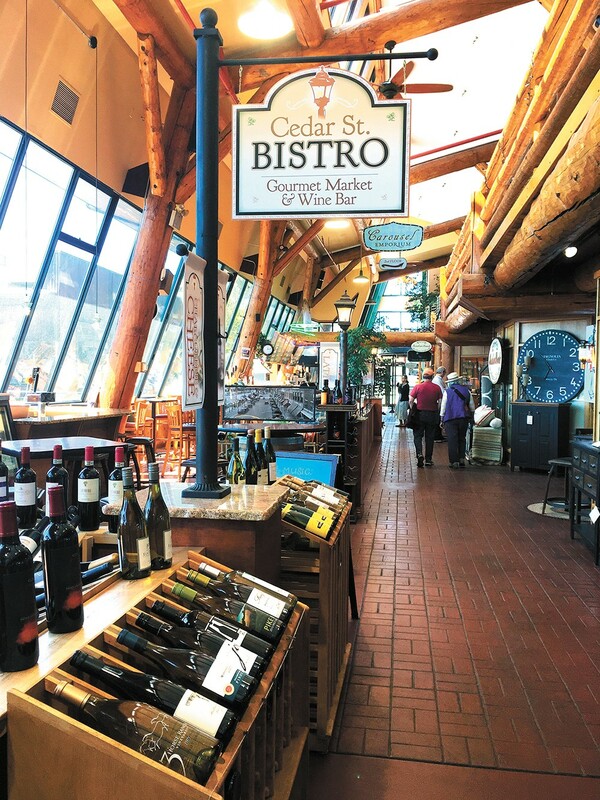 The bistro is the first business visitors see when entering from Cedar Street, and is located inside the south-facing, open-air portion of the market's lower level overlooking Sand Creek. Businesses on this side of the Bridge, which now has 16 tenants, are demarcated not by physical walls, but rather railings, equipment, furniture, signage and, in the bistro's case, a wraparound area of countertop and display areas packed full of homemade gelato, scratch-baked goods, salads and ready-to-serve items. Tim, who'd been working for Diedrich Roasters, was initially inspired to open the bistro at coffee-roasting seminars where attendees shared stories of coffee shops they'd visited. He also has a business background that the couple felt they could build upon with a shop of their own. The Fraziers also operate two additional businesses on the north side of the Bridge: Huckleberry Depot and Uniquely Sandpoint, which sell themed items and offer browsing opportunities for those awaiting one of the Bistro's artisan coffees, grilled sandwiches or wraps, daily soup, stone-baked pizza or crepes. The recipe for their now-proven business model? Serve the best quality they can and know their price point. "We also listen to our customers," Manuela says. "Families come in with kids and we have something for everyone." The Bistro's menu is displayed on a meticulously lettered chalkboard, which can be revised as needed, and often is. "We couldn't just have coffee," notes Manuela. Over the years, the couple continued to tinker with the menu, steadily expanding it according to not just customer input, but also their employees. "We encourage our employees to bring in recipes to try out," says Tim, who credits those employees, especially longtime manager Maggie McCallum, with helping to evolve the business. Fully staffed, the Bistro has 11 employees in winter and upwards of 17 during the summer, Tim says. Reliable staff has allowed the couple to take time off, in turn giving them opportunities to see what else is happening in the restaurant industry. When they come to Spokane, for example, the Fraziers like to visit the Wandering Table in Kendall Yards, as well as Clinkerdagger, which Manuela says reminds her of her native Germany. As for longer trips or even the prospect of retirement, someone has to stay on-site, says Manuela, who adds that many are in awe that she and Tim are such hands-on owners. "Guess who does dishes when it's busy?" she asks rhetorically. "Tim." The original print version of this article was headlined "In a Word: Work"